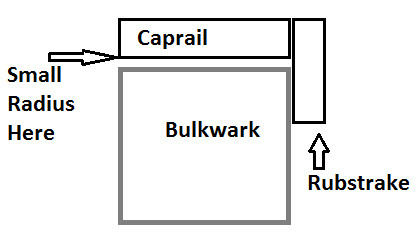 I got back to work on the rubstrake and caprail this week. 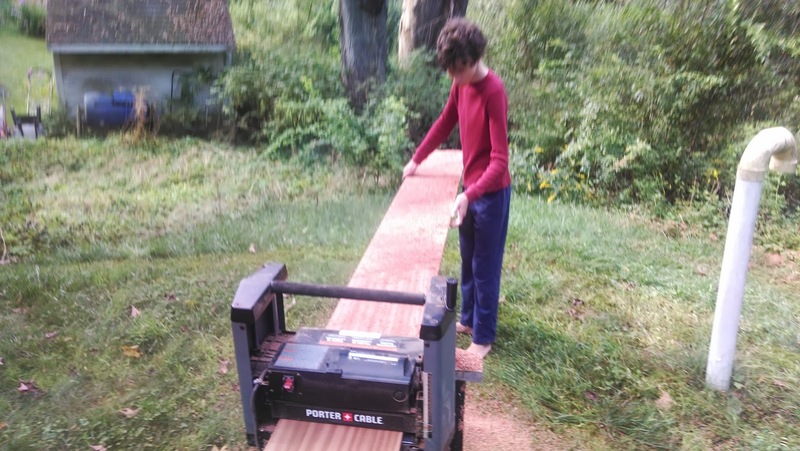 I started out by turning most of a big, expensive board into sawdust by planing it down from it's initial 1" x 13" into 6 - 1/2" by 2" strips with the help of my son. The cats now have some very fancy Sapelle shavings for their cat litter. I'm sure they appreciate it. 'end caps' became more complicated than I would have liked. To solve this for each side of the bow (separated by the headstay chainplate), I laminated 2 - 1" pieces of Sapelle to form a 2" x 2" square. When they had cured I shaped them down to account for the short part of the caprail and wrap around the bow so it could be shaped once epoxied and screwed into place. 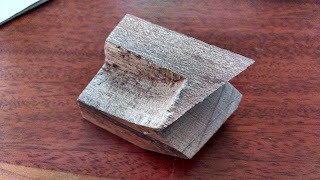 I also notched each block to accommodate the 1/2" rubstrake coming in on the side (see photos above). In hindsight, I should have oriented the grain of the blocks to run fore and aft, but now that it's done I'll just have to live with it. Next, with the exception of the bow and stern pieces (which I left at full length to cut off later once the transom rubstrake was fitted) I cut 45 degree angles longitudinally on each of the 6 rubstrake strips so when they were installed, the strip aft would notch into the forward piece snugly. I did a rough fit by tapping and countersinking screws 8" on center while I had my kids hold the strip to the curve of the caprail. At this point the strips were anywhere from 1/8" to 1/4" proud of the caprail depending on where they were mounted (the forward sections along the bow curve inward more than midships), so I took a block plane and cut them down so each strip was roughly flush with the caprail. 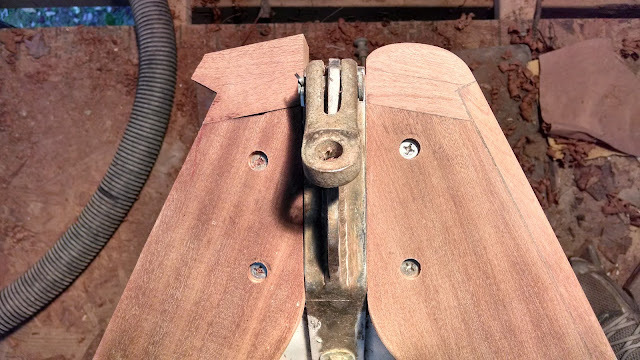 Being just a rough fitting, I still had to pull all the strips off and clean them up by running a roundover bit with the router along the bottom edge and sand them to 150 grit. As with many things on this job, you get to a point where you build things up and then you have to tear it all down again to prepare for the final installation. 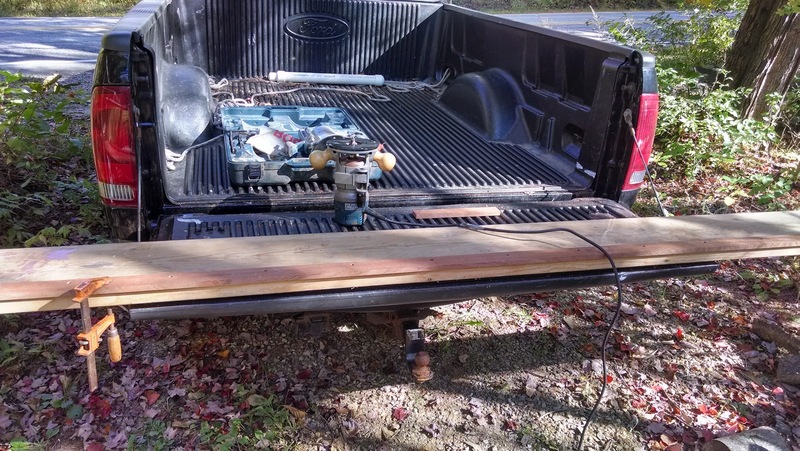 The weather has been about perfect the past week or so (mid 70s and dry) so I clamped a big board to the tailgate of my truck and did the routing and sanding outside. Before I could proceed further on the side pieces I had to get the transom piece in place so I could determine where to cut off the aftermost strip on the stern. 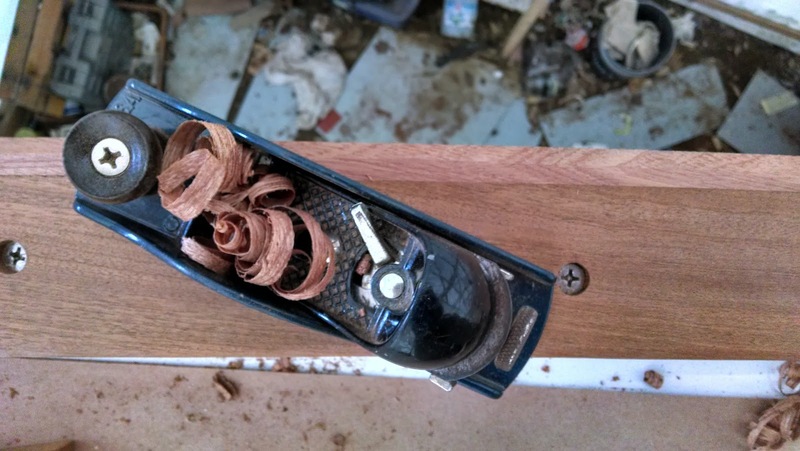 I channeled my inner cheapskate and coupled that with a healthy fear of trying to bend a board around my decidedly round transom and decided to laminate a bunch of strips together to form the transom rubstrake. 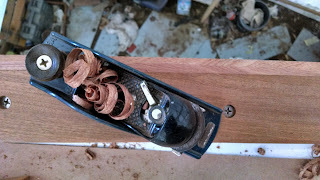 I just could see wasting a 10" board for this section when I had a lot of narrow pieces that would form a nice curve and would do the job just as well. So I rummaged around the floor of shed and found the original transom rubstrake and screwed it onto a flat piece of plywood to use as a form. 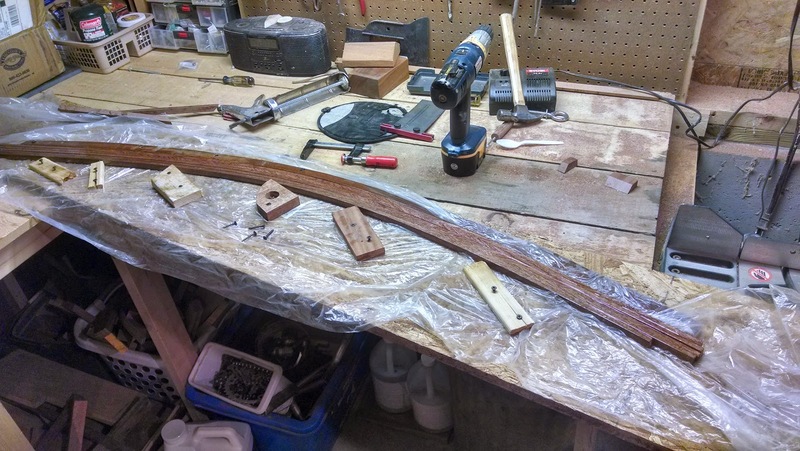 From my narrow stock I cut a bunch of 1/2" strips about 65" long and mixed up a batch of unthickened epoxy and laminated them all together and clamped them to the form. The one mistake I made was using a piece of really thin plastic to put down on the plywood so the laminated piece would stick. It bunched up like crazy and I subjected my wife and kids to special words normally reserved for conversations on the dock with commercial fisherman. I should have used a piece of thicker plastic (7 mil shrink wrap has worked well for me in the past), but I eventually flattened it out well enough to get the lamination set. 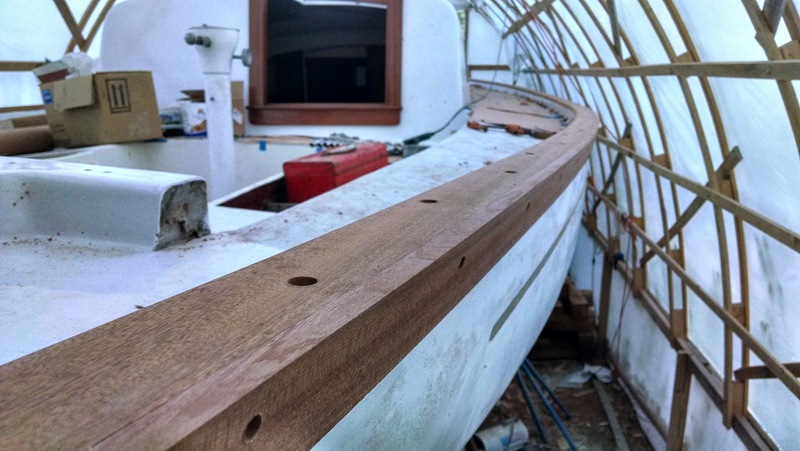 After it cured I planed it down to 3/8" and brought it over to the boat and got it properly fit and the top planed flush with the caprail. I'm pretty pleased with how it turned out. 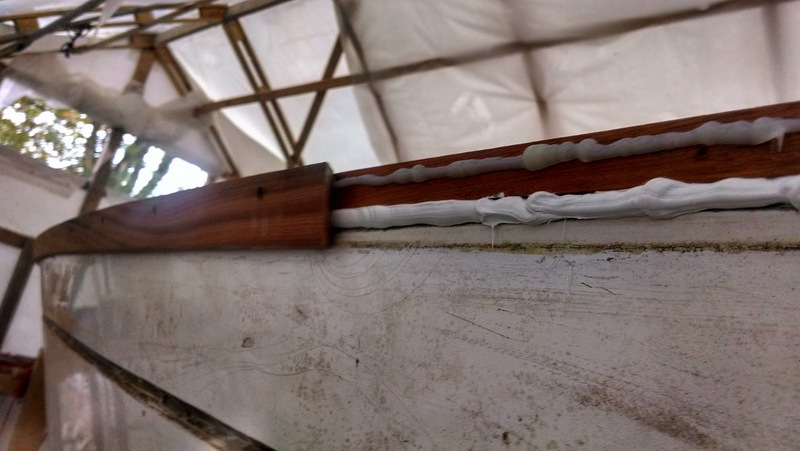 For the final installation, I decided that I would run a bead of epoxy along the caprail to glue the rubstrake on (along with the screws) and then run a bigger bead of SikaFlex just below that along the hull-deck joint to prevent water intrusion. This is where the epoxy cartridges with the static mixers pay for themselves. They are very neat and allow you to really target specific areas for epoxy and you don't have to worry about batches kicking too early or that the mix you prepared will drip and run over everything. Your guaranteed of a consistent mayo like consistency that will stay put until your ready. With that said, once I ran the epoxy and SikaFlex beads, I enlisted my whole family to help because I didn't want any sticky mistakes and having several extra hands always comes in handy. 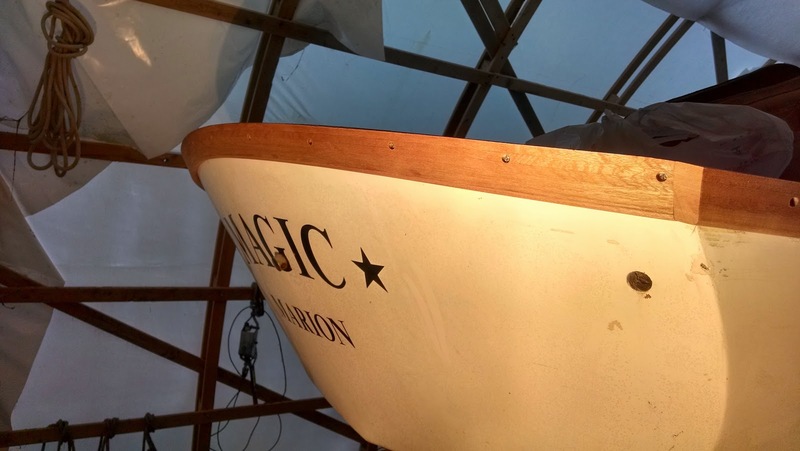 I stared at the bow with my wife or one of the kids holding the aft end of the strip and mushed the forward end onto the caprail and got a screw in before seating the rest of the strip. 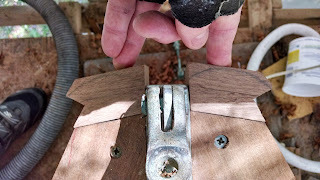 I slowly worked aft seating and screwing the strip onto the caprail and allowing a generous squeezeout of epoxy on the top to fill and mask any gaps between the strip and caprail. 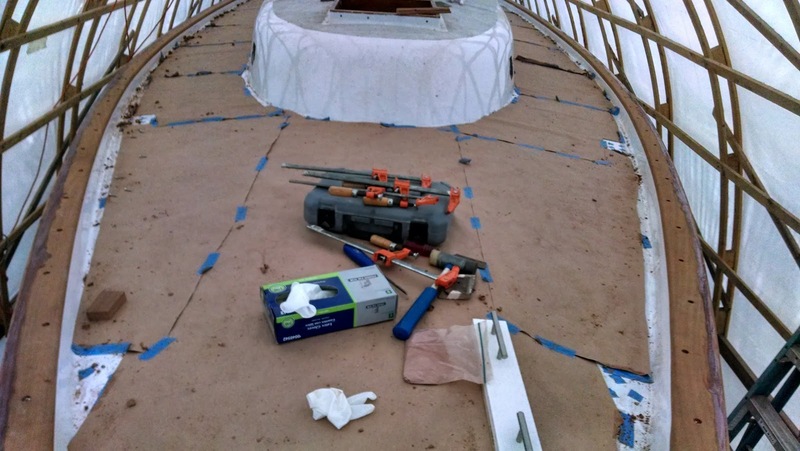 With all the preparation beforehand (pre-tapping and getting everything properly fitted prior to epoxy), the whole process was uneventful and just took time and care. We did the starboard side one day and the port the next. Now I'll let it all cure up and then start cleaning up the glue lines and do the final roundover on the top of the rubstrake. I was overly curious and decided to do a little shaping on the starboard side bow to see how the blocks I added forward will look. It's not perfect; there's a bit of a gap where the rubstrake meets the caprail on that section, but I'm pretty pleased given the fact that that area turns hard under to accommodate the sweep of the bow and the initial planing of the caprail was not easy.